I have to be honest, this has been a tough couple of weeks. Slipping on the ice and giving myself a concussion – not fun. Having the fog evaporate and realizing exactly how much fell through the cracks when I was off in concussion-la-la land? Really not fun. In a really really kind of way. Especially when this week is one of the biggest weeks work-wise of my whole year. Which is why this week has been one of those off-the-charts I Am A Horrible Mother weeks. When my ten-year-old woke up on Monday complaining of a stomachache – which had been an ongoing complaint throughout the week before but had gone away over the weekend – I wasn’t the most sympathetic. But we went to the doctor and they said a bug was going around and that it might not be a bad idea to keep him home for the day and, and, and… The fact that my first thought was frustration is not something I am proud of. The fact that work even factored into my thoughts makes my heart hurt. But it did. And, yes, when I drove off to a meeting that I had to attend, even knowing that I’d left him in the highly capable and loving hands of my mother-in-law, I pretty much cried the whole way there. So you can imagine my complicated feelings when, at 9:12 yesterday morning, my phone rang and the name of his school popped up. To my surprise, though, what happened from there wasn’t a “Please come get your son because we have 700 students in our school and I can’t have him lying here”; instead, the nurse took the time to talk to me about what was going on, to hear the concern and, yes, frustration in my voice, and then tell me to give it a little time and see how the morning played out. With another meeting on the schedule (big week work-wise, as I mentioned), I arranged for my husband to be available should the next phone call come. Two hours later, after monitoring my phone and seeing nothing, I called the school back and checked in. The nurse, as it turns out, had watched over Will for awhile and then took him back to his class and talked to his teacher. And between the two of them, they managed to get to the bottom of it: anxiety. Big-time, big picture anxiety, but anxiety nevertheless. Other than to say that I fully understood it once they figured it out, I’m not going to go into what it was about – that’s Will’s stuff. But the reason I’ve gone into all of the above in the first place is because, well, I love his teacher. I find I love his school nurse, too. 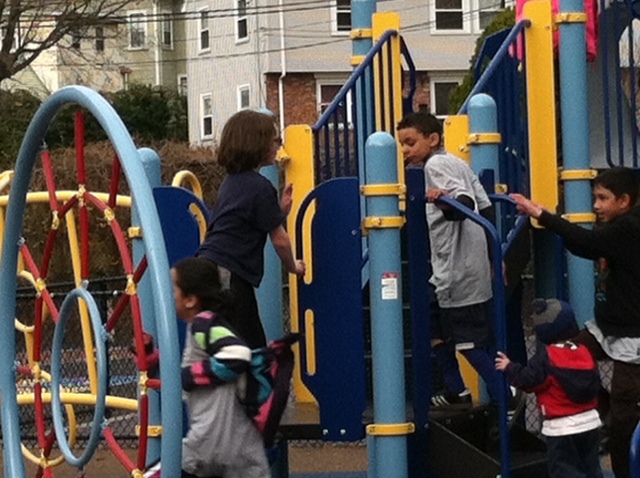 In fact, I love the whole support system that this 700-kid school — in the big Boston Public School system — has. And it made me think about what it means to have a place that we love and trust to send our kids to. I mean, regardless of why we choose to send them – and whether it’s a choice or not – there’s going to be guilt involved. Right? It’s that I Am A Horrible Mother thing, even if you, like I, believe that a happy mom makes a better mom. But that’s why our choice is so important. It’s why we choose a place like Pine Village. What I also (to this day) remember, is the complete breakdown I had in the Pine Village parking lot after dropping him off on his first day back at school. If it weren’t for his teachers and the staff there, I can pretty much swear to you that I wouldn’t have made it through that experience. I would have kept him home and in my arms for, well, ever. And he would have ended up as petrified to leave our house every day as I was to let him go. But they watched over him and they watched over me; they looked out for things he could have a reaction to, took possession of the Epi-pens and the asthma meds and all of the doctor’s forms and instructions… and through their patience, reassurance, and confidence somehow managed to get me to let him continue on with being a kid. Just like his teacher and his school nurse today. And I am so grateful for all of these wonderful people who have become a part of our lives. Although it is only April and that pesky ice isn’t as distant of a memory as we might like, we’re all thinking about summer and enrollment for next year. For some of us, that means leaving Pine Village and heading into much bigger, big-kid schools. For some of us that means leaving our daycare – or maybe transitioning out of a stay-at-home experience – and joining Pine Village. We love where we are now; we don’t want to change. But change is necessary and it is good. We know that, but we fear it too. Because ‘change’ when it comes to our kids means a lot of tears – both theirs and ours. I mean, you know me – you know I love Pine Village; you know I’m thrilled for two-year-old James to finally be there in the Fall. But I, too, fear that moment when James realizes that he won’t be seeing his classmates Annika and Rhea and Scarlett the next day, but instead will be staying at this new school. Yet I know that the teachers and staff at Pine Village will care for him and love him nearly as much as I do. And when it’s time to leave Pine Village, I’ll do so knowing that there are teachers and school nurses and a whole host of other people that will take care of him and support him each and every day. Whether you’re heading to Boston Public Schools (as Will and his older sister, Lucy, have) or a school in Newton, Needham, Cambridge or beyond. So I’m going to savor these last few months with Annika and Rhea and Scarlett, but I’m not going to fear the Fall. Instead I will look forward with excitement to the moments yet to come, and to the new (and old) wonderful people who will become a part of our lives. 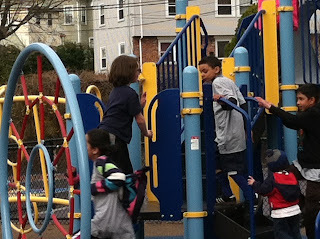 A few minutes ago his teacher texted me with an update that he was heading off to soccer and all seemed well. When I texted back and asked if I could talk to him – because I’m not actually a horrible mother at all and I really needed to hear my baby- um, I mean, my big boy’s voice – two seconds later the phone rang. “Hey, Mom! What’s up?” he asked, a universe away from the sick kid I’d spoken to in the morning. “O.k.,” I said into the silence as he handed his phone back to his teacher. “Love you,” I added, even though it was probably Ms. Harmon on the phone at that point. And, you know what? It didn’t matter who I was talking to at that point. Because either way, I do. whoever was “It” at the time. Clearly doing much better!